This boutique wine estate property is gated and immensely private and has unparalleled and forever unobstructed 360-degree views, yet is remarkably close to Stellenbosch, Somerset West and a short drive to the city of Cape Town. 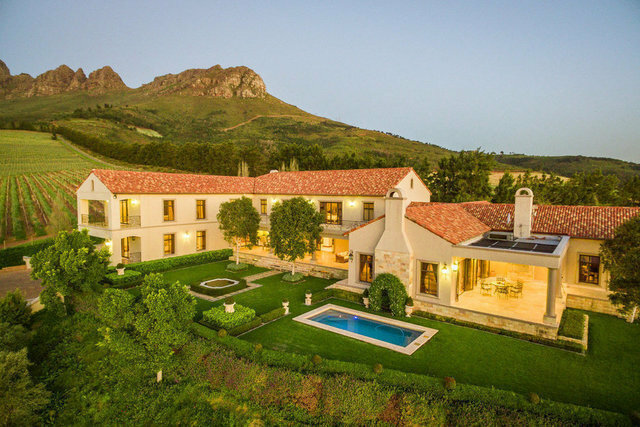 This slice of heaven is designed to make you feel on top of the world and sits high on the magnificent Helderberg Mountain and is neighbour to many desirable Stellenbosch Vineyards. The views from this home define the term panoramic with magnificent vistas as far as Cape Town, Robben Island and False Bay. Proudly positioned at the end of a security controlled Cul de Sac, a long driveway leads to the expansive motor court and custom-built primary residence where luxury and comfort are intertwined. The sprawling grounds feature a large swimmer's pool, many inviting terraces, mature gardens, and various outdoor entertaining areas from where the lucky owners can enjoy the spectacular African sunsets whist savouring the wine produced on the farm. Rarely is one presented with such an opportunity to experience the verdant tranquillity, luxury, and technologic innovation that this estate provides. The unparalleled construction, state of the art infrastructure and views truly make this home one of the crown jewels of the cape Winelands. Despite its grand scale, the Tuscan themed home is a modern-day grand living experience and yet the quality finishes and refined style exude warmth and comfort. Unifying the highest quality of engineering and technology the main residence includes 5 expansive bedrooms suites and 6 bathrooms. Wood-burning fireplaces punctuate gracious rooms for entertaining with the finest in details, materials and craftsmanship. On the main floor, a gourmet chef’s kitchen with professional grade appliances serves as the culinary enthusiasts’ dream, while the inviting living spaces ooze gracious luxury. The home was conceived with the premise that if friends and loved ones wanted to gather simultaneously, there would be a place for everyone and amongst the plethora of indoor and outdoor, formal and informal spaces, private bar and wine cellar, the owners have certainly created their dream home. Taking full advantage of the views of majestic mountain vistas, forested hillsides and sunsets, this is one of the unique positions where a view of both the Atlantic and the Indian Ocean can be enjoyed and will provide a special and irreplaceable home for the lucky buyer.